This is the second part of our “visa run to Vientiane” guide, dealing with how to obtain a Lao visa-on-arrival, get across Friendship Bridge and to the Thai consulate, and how to apply for a fresh Thai visa in Vientiane. 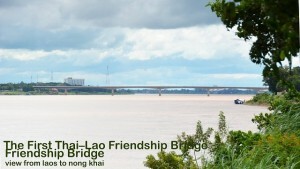 The Thai-Lao Friendship bridge (Saparn Mittaparp in Thai) between the northeastern city of Nongkhai and Laos (Vientiane province) was the first bridge to cross the lower Mekhong River and to link the communist Lao People’s Democrat Republic with Thailand. With a length of 1,170 meters, the bridge has two road lanes, two footpaths and a railway line in the middle. Opened in 1994, the “First Thai-Lao Friendship Bridge” has significantly boosted tourism and trade between both countries. The construction of a 35-km rail link crossing Friendship Bridge and linking Nongkhai’s railway station with Thanaleng Station in Laos (13 kilometres short of Vientiane) has been completed in 2008 and is open for public service since May 2009. The bridge is situated just a couple of kilometres outside Nongkhai’s city centre. From the Lao border post on the other side of the Mekhong River – depending on the means of transport – it’s a 30-45 minute drive to Vientiane. The Thai border post opens at 6 a.m., but make sure that you wait in the right queue – there are different queues for Thai, Lao nationals and foreign visitors. 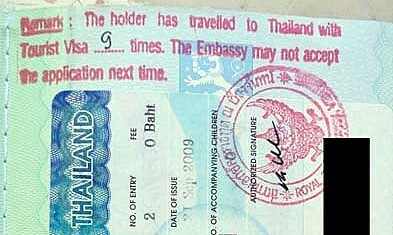 You should also have at least 1½ blank pages left in your passport, which are required for the Lao visa sticker, exit and entry stamps. If you have an overstay, Thai immigration will charge you an “overstay fine” of 500 Baht per day, to be paid in the main building left of the immigration booths. Upon receiving your exit stamp on the Thai side of the border, a shuttle bus will take you across the bridge to the Lao border post. The ticket costs around 20 Baht. It is not allowed to cross the bridge on foot. Please also note that the first shuttle bus won’t depart before around 6.30 a.m., before which time only private vehicles and tour buses may cross the bridge. From 7 a.m. on, shuttle buses should leave every 10-20 minutes. 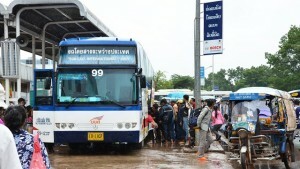 Direct buses from Nong Khai (approx. 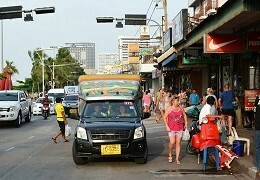 30 Baht one-way) or Udon Thani arrive at – and depart from – the bus terminal right in the city centre of Vientiane, opposite the so-called Morning Market (Talaat Sao in Lao). A trip on these comfortable coaches is not an option, however, if you plan to obtain a Lao visa on arrival at Friendship Bridge as the bus won’t wait long enough for you to arrange your visa. Unless you’ve used the service of a “visa office” in Nong Khai to arrange your Lao visa in advance, a visa-on-arrival can be obtained conveniently from the Lao border post at Friendship bridge. All you have to do is fill and submit an application form, and pay the visa fee at the counter. 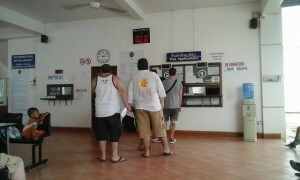 Your Lao visa-on-arrival (a one-page sticker or stamp) will usually be issued within less than 10 minutes. As from 2008, all visa applicants will receive their visa complete with an entry stamp, so don’t forget to also fill your arrival/departure card together with your application form and submit them both at the main office. The Lao visa-on-arrival fee for visitors from most Western countries is US$30-35. Payment in Thai Baht is also accepted but slightly more costly than payment in dollars. 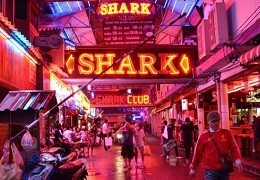 So exchanging a few Thai Baht to US dollars in advance may well save you a couple of hundred Baht. There’s also a small money exchange booth just around the corner from the visa-on-arrival counter. 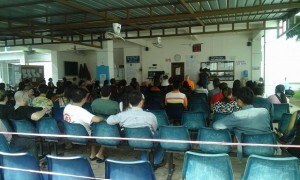 From 6 a.m. to 8 a.m. and after 4 p.m., visa applicants will be charged an “overtime fee” of 40 Baht or US$1. 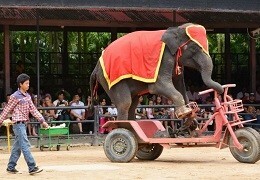 In addition, an “entry fee” (20 Baht or so) may be charged. There are three options for getting to Vientiane’s city centre or the Thai consulate – by taxi or minivan, by tuktuk and by public bus. After you’ve crossed the Thai-Lao border officially you will automatically bump into dozens of taxi and Tuktuk drivers, all offering their services at what you may find stunningly high fares. Rip-off? Not necessarily. As fuel prices in Laos are significantly higher than in Thailand, means of transport are also relatively expensive. If you want to reduce your transfer costs it might be a good idea to join other visa runners (many of whom also head straight to the consulate) and share a taxi with them. If you plan to stay in Vientiane for only one night and wish to obtain your new Thai visa the next day, please note that visa application is possible only before 12 p.m. If it should be past 9 a.m. already it’s recommended to drive straight to the consulate before looking for a room. Depending on how busy it is, especially on Mondays or following public holidays, the Thai consulate may close its gate as early as 10.30 a.m. or so and no longer accept visa applications. Tuktuks are the most traditional but also least comfortable means of transport and available from roughly 150 Baht. As there are no fixed rates (or they are rather high) fares will basically depend on your negotiating skills and what you’re willing to pay for the 30 to 45-minute ride into Vientiane. Unless you travel with a group of friends anyway, it will significantly reduce your costs of transport if you share the tuktuk with other “visa runners” you may have met at the border and who also head straight to the consulate. If you should find a tuktuk driver who promises to charge you just a fraction of that price, you can be sure you won’t be his only passenger, but he’ll pick up and drop off other (Lao) passengers all along the way; which may extremely delay your arrival at the embassy or your hotel room. Taxis and modern air-conditioned minivans are available from approx. 200-300 Baht (though many drivers will ask for up to 500 Baht to take you straight to the Thai consulate.) Especially when you’re traveling with a group of friends or other “visa runners” and you can share the costs, this is definitely the most comfortable means of transport to Vientiane. A taxi or minivan ride to Vientiane or the Thai consulate shouldn’t take longer than 30 minutes. Air-conditioned buses to Vientiane’s central bus terminal opposite the Morning Market (Talaat sao) leave from a “bus stop” (a row of blue benches) at the car park just behind the border post at Friendship bridge. The fare is 30 Baht per person but unless you’re really on a budget, we’d advise you to stick to taxis or minivans – slightly more expensive but definitely worth it, especially if you’re heading straight to the consulate and time is short. A rail link between Nongkhai and Thanaleng Station near Friendship Bridge, some 13 kilometres short of Vientiane, has opened for public service in 2009. 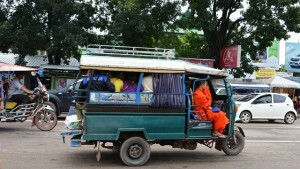 A plan to extend the line straight to Vientiane’s city centre is reportedly also under way. If this plan is ever put into action, it should be possible some day in the future to take a train straight from Bangkok to Vientiane; however, we would expect “several more years” to pass by before this project will be completed. The Thai consulate is open from 8.30h to 12h in the morning and again from 13h to 16h in the afternoon. Except for Thai and Lao holidays, the consulate opens daily from Monday to Friday. Visa application is from 8.30h to 12h only (no visa application in the afternoon) but if they’re busy they may stop accepting applications as early as 11h or even before that. If you arrive “too late”, you’ll have to apply the next day. It takes one working day to issue the visa, and you can pick up your passport the following day after 13.30h. Note: Due to a daily flood of visa runners from Thailand, the consulate has become exceedingly busy over the past decade, especially following weekends and public holiday periods, so it’s highly recommended to turn up as early as possible to make sure your visa application gets approved before noon. Tuesday and Wednesday seem to be the best days to apply for your visa. With hundreds of expats and long-stay tourists descending on Vientiane in organized visa run tours, Monday and Thursday are easily the busiest days and to be avoided. Unless you like to stay for the weekend, Friday is obviously also a bad choice. Starting from September 2015, the Thai consulate in Vientiane has launched a new “fast track” visa service, making the application process considerably faster and more hassle-free. Same as before though, you’ll still have to wait one working day for your application to be processed and have to spend at least one night in Vientiane. While previously each applicant had to pick a card with a number and wait for his number to be called to submit his documents, now you only have to drop your passport and relevant paperwork in a box or hand it over to consulate staff at a desk in the open air outside the smaller open-front building. Application forms are available from staff behind the counter or visa touts outside the consulate compound. Once you’ve submitted your visa application they’ll give you a kind of “receipt” with a number attached to it. You will have to keep this very carefully as you’ll need it to pick up your passport the next day. Aside from a fully filled application form, you need two recent passport photos and signed copies of the relevant pages in your passport (further documents may depend on which specific visa you apply for.) Please also note that from September 2015, visa applicants will have to provide an “actual street address in Thailand”, so the name of a random hotel in a random Thai city won’t be sufficient. 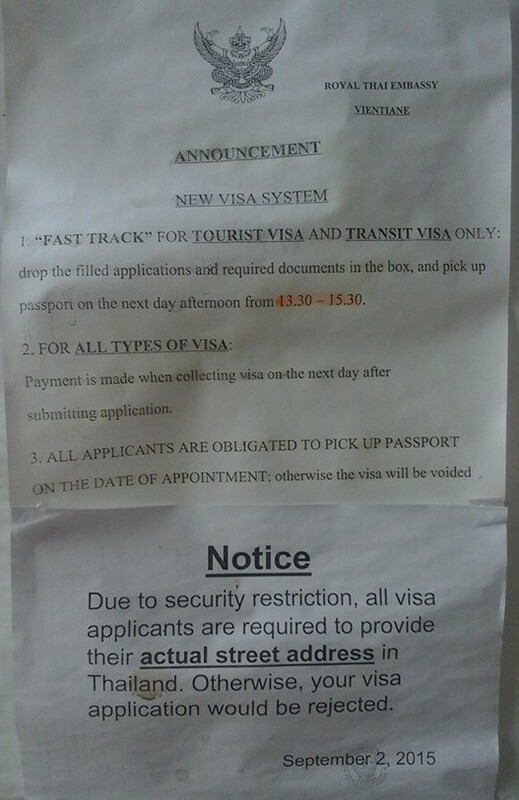 What is also new is that you have to pay your visa fee only when you pick up your passport the following day. As payment must be made in Thai Baht (Lao kip are not accepted) make sure you keep enough Thai Baht on you until you’ve received your fresh visa. The “receipt” they give you when you apply for the visa has a number attached to it. When you go to pick up your passport the following day you’ll now have to wait until they call that number or it appears on the display (you won’t have to pull an extra number); then you go to the counter, pay your visa fee and you’re done. It is simple but perhaps a bit more time-consuming. They obviously start with numbers 1, 2, 3 etc. so if you have no. 200 or an even higher number you can expect to wait until at least 3 p.m. What is also new is that you must obviously pick up your passport the following day; otherwise your “visa will be voided”. 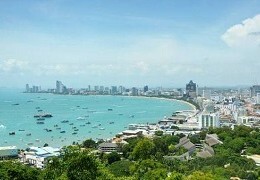 While tourist visas are in principal a doable option for those staying in Pattaya for longer than a couple of months only, long-stay “tourists” who virtually live in Pattaya on the basis of back-to-back tourist visas may sooner rather than later face problems applying for a new visa. In a crackdown on 60-day tourist visas enforced since late 2009, several Thai consulates in the Southeast Asian region have become increasingly tough on issuing back-to-back tourist visas. 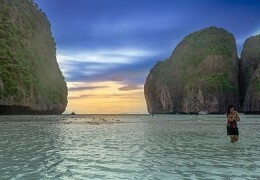 Applicants, Thai immigration announced then, would now face stricter screening measures to make sure they were actually “tourists” and use a tourist visa not as a way to work in Thailand illegally. Applicants with “too many” back-to back tourist visa stickers in their passports might have a new application refused. The biggest drawback though is obviously the launch of the new multiple-entry tourist visa (METV) which can be applied for only in the applicant’s home country. As a result, the formerly popular double-entry tourist visa has been abolished altogether in November 2015 and is no longer available in Vientiane. With only single-entry visa available now for foreign (non-Lao national) applicants – a restriction that automatically necessitates more frequent visa runs – chances that back-to-back applicants may sooner or later get rejected are obviously rising.